This shower curtain is designed and produced by well-known German brand Kleine Wolke, established in 1968, and is backed by their quality guarantee. A luxurious, quick-dry and easy-care polyester fabric, as used in many high-end hotels. 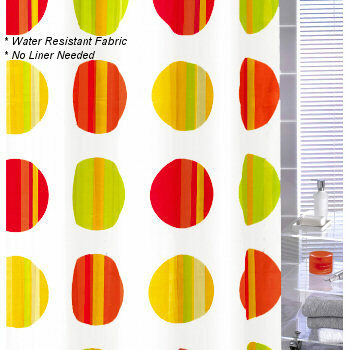 Our Point shower curtain features a scene of 8 inch MULTI-COLOR jewel tone deep yellow, bright lime green, red and rust / orange circles over a white background. We also offer a TOFFEE color with beautiful deep chocolate brown, red mohogany, toffee and light beige 8in circles on a white background. The Point non toxic fabric shower curtain is available in standard tub width - 12 eyelets.